Dallying In The Dirt, Issue #337 - This ghostly Nootka is a continuing source of joy in my yard. Hooray! Spring is here. The Witch Hazel is in full bloom and it is glorious this year. We won’t mention the 7 cm of heavy wet snow that surprised us on Sunday morning. It was an April Fool’s joke a day early. There’s only a few lumps left here and there in the shady areas, like in front of the garage door. I went to get my loppers to chop up the branches I had removed from the Harlequin Maple and I couldn’t get that north facing door open. 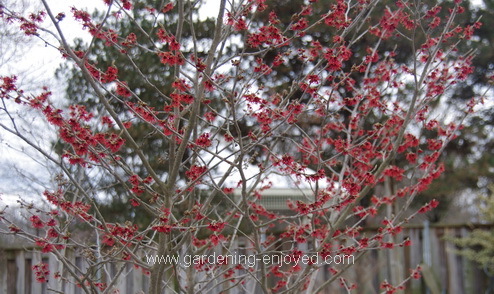 Of course any tool I might use to move that ice was inside the garage:-( Meanwhile back to the Witch Hazel. I gave you an overall picture this year rather then a closeup so that you can see how heavy and showy the bloom is. The variety is Diane if you want to go looking for one and, yes, the blooms are a rich deep red. Every yard should have one to give us hope that spring is actually happening. The snow on Sunday had little or no effect on it. The Snowdrops continue to appear in various parts of the garden as the sun reaches each corner and if you look closely there are lots of other bulbs starting to poke their noses through. While wandering through the garden looking for other signs of spring to talk about, I stopped to admire this tree. We get excited about things that appear on a seasonal basis and sometimes forget to admire the more permanent bones of the garden. I planted this Nootka, Chamaecyparis nootkatensis pendula several years ago because its hanging, rather ghostly, form has always been a favourite of mine. I apparently have no record of when I planted it but it was probably more than 10 years ago and it is now about 4.5 M (15') tall and makes a very interesting focal point in the back yard. As you can see it is not really very wide but they can develop some width as they get older. Now, the question is whether I prune the top off to make it widen out or let it continue to grow so that it starts to conflict with the branches of the big Walnut tree. Not a decision I’m ready to contemplate. I just continue to wander past it most days and admire its fascinating structure. We should all plant a few permanent things that give us some enduring pleasure. The early vegetables have all been transplanted from the seedling trays into their cell paks and are thriving under their lights. I replaced many of my fluorescent tubes this year. 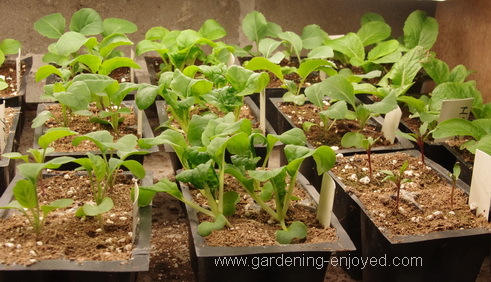 They do tend to fade over the years before they eventually quit and the new tubes have given me an increased amount of light to keep those transplants growing short and sturdy. When I’ve published this “Dallying” I’ll be heading back to the basement to plant some Tomatoes and other late season veggies that take about 8 weeks to reach outdoor size. Space is rapidly becoming a problem as it does about this time every year. It’s time to plug in the heating cable to make the outdoor coldframe turn into a hotframe. After a few days of heating the sandy floor of that unit I will be able to move many of the cold season vegetables out there. There are 3 varieties of Pak Choi, as well as Kohl Rabi, Broccoli and a few varieties each of Cauliflower and Cabbage. The previously sown Peppers and Eggplant have all germinated and will be transplanted to cell paks as soon as the first pair of true leaves appear. That’s a term we use that sometimes confuses beginners. When the seeds first germinate those simple leaf like structures are the cotyledons or the fleshy parts of the seed. After they are established the seedlings will grow a set of true leaves that resemble the leaves of the mature plants. Yes! There are several types of annual flowers sown as well as the vegetables and more will be sown soon. Carol Asks? Why do my broccoli seedlings stretch & end up with long necks? I have them as close to the light as possible. Are my floscents grow lights not strong enough? Ken Answers! Broccoli and similar veggies do have a tendency to stretch a bit and if you have the lights close then there is not much more you can do. I replace my lights every few years as they tend to get dimmer over time rather than just quitting suddenly. Transplanting seedlings into cells and planting a little deeper can help with the problem. Wendy Asks? I'd like to expand and extend my vegetable garden/season and rather than build a greenhouse, I'm looking for one or two indoor units (I'd like fresh lettuce and baby greens in the winter) and I'm not the handy type either. So far, the only really good ones I've found are from Lee Valley, and they start at $339. It's more than I expected, though it is a beauty. Is this pretty much the going rate? Could you recommend any others? Ken Answers! The Lee Valley one is good but I'm not familiar with what is out there as I have always just built my own with the cheapest fixtures from the DIY store. If I was starting I might look at some of the new ones with LED lighting, a bit more expensive to purchase but very economical to operate and they last a long time. Angela Asks? I was at your talk last night and asked about the yellow orchids Just a ? About the earth box does the watering tube have an indicator that tells you how much water is the reservoir Also do you use the soil and fertilizer they sell if not what do you use? Ken Answers! No, there is no indicator in the fill tube. It does have an overflow so I just top them up regularly. It takes fewer days to empty them when the they are full grown. I do not use their soil and fertilizer because there is nothing special about it and it costs too much to ship it. Buy it locally. Pro mix or Agro mix for the soil and I usually use Acti-Sol for the fertilizer because it's organic but any vegetable fertilizer will work well.